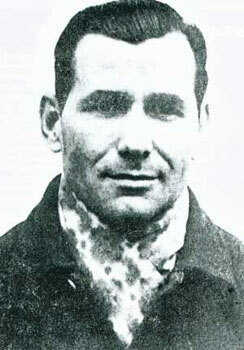 A short biography of Sabate - the most famous and one of the most tenacious fighters in the armed resistance to Franco. Surviving longer than many other guerrillas, he finally succumbed to the bullets of the Civil Guard in 1960. Francisco Sabaté Llopart (known as 'El Quico') was born 30 March 1915 in L’Hospitalet de Llobregat in Barcelona. Sabaté joined the Spanish anarchosyndicalist union the CNT in 1931. In 1932, following the events of Fijols, he started the action group "Los Novatos"(The Appretices) which aligned with the Iberian Anarchist Federation (FAI). The group participated in the insurrectional movement of 8 December 1933, and in 1935, they carried out their first expropriation (robbery) to provide funds for a prison relief group. On July 18 and 19, 1936, the fascist uprising in Barcelona, led by General Franco, was defeated, signalling the beginning of a libertarian revolution and the Civil War. On August 27, 1936, Sabaté and his brother José joined a CNT-FAI column - the “Young Eagles” which fought on the Aragon front. When the war ended he was in the 26th Division - the Durruti Column, named after Spanish anarchist Buenaventura Durruti - that crossed the French border. With the defeat of the Republican forces, Sabate was interned in France in the concentration camps in Vernet, and then fought in the French resistance against the Nazis. In 1945, Sabate continued fighting in Spain clandestinely as part of a large guerrilla movement, and on August 20, 1945, succeeded in freeing two imprisoned comrades. His group then began striking against the Franco regime and its supporters, as well as robbing companies and banks to finance the underground movement. On March 2, 1949, they killed two heads of the fascist movement the Falange. This struggle against tyranny lasted fifteen years. 'El Quico' became Public Enemy No. 1 and was a permanent nightmare of the authorities. While many of his comrades were arrested or killed over the years - including his brother Jose in 1949 and his other brother Manuel in 1950 - Sabaté succeeded in slipping through the various police dragnets. On 30th December 1959 he crossed the French-Spanish border for the last time, and on the 5th January 1960 was killed in Sant Celoni by the Somaten (a Catalan fascist variety of Home Guard) and the Civil Guard, after a series of slip-ups which seem more like a Hollywood movie than real life. Four of his companions who accompanied him on this trip all perished in the undertaking. They were Antonio Miracle Guitart, 29; Rogelio Madrigal Tories, 27; Francisco Conesa Alcaraz, 39; and Martin Ruiz Montoya, 20. 'El Quico' still managed to escape, but died a few hours later from his wounds. He was 45. "We are not robbers, we are libertarian resistance fighters. What we have just taken will help in a small way to feed the orphaned and starving children of those anti-fascists who you and your kind have shot. We are people who have never and will never beg for what is ours. So long as we have the strength to do so we shall fight for for the freedom of the Spanish working class. As for you, Garriga, although you are a murderer and a thief, we have spared you, because we as libertarians appreciate the value of human life, something which you never have, nor are likely to, understand." Edited by libcom from two articles - one from the Daily Bleed and one from the pamphlet The Anarchist Resistance to Franco - Biographical notes , by Antonio Tellez. £2, published by the Kate Sharpley Library.